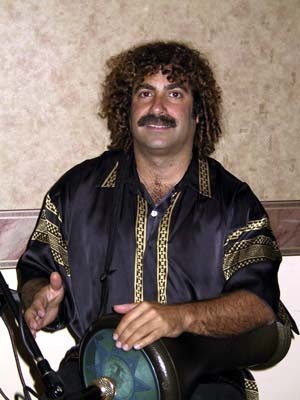 Frank Lazzaro has been in the San Diego area since 1986, where he has studied Middle-Eastern and African drumming extensively. Frank teaches dumbek in both group and private settings, and regularly drums for bellydance classes. He is curently on teaching staff at World Beat Cultural Center, San Diego. He also has an instructional CD available for students of middle eastern drumming and dance. Frank has performed annually at MECDA's Cairo Carnival and is a member of SAMEDA. He is active in the San Diego dance scene, and produces monthly shows at Claire De Lune in North Park, featuring live music and dancers. Here he has accompanied John Bilezikjian and other great musicians in these exciting and successful showcases. Frank is the lead drummer in two world music groups, Damaru and Middle Earth Ensemble Middle-Earth has 2 CDs available and was the recipient of the 2006 Golden Belly Award. Frank can always be found at local events, supporting the music and dance with his enthusiastic spirit. He is available for performances, workshops, and also has Egyptian drums available for sale.